Sometimes we come across many files with unusual names. To make it easier to find, we will have to rename it with friendly names. Its easy to rename multiple files in windows, just drag and select required files, right click on it and type a new name. Every file will get renamed with unique number at the end in incremental manner. But you won’t find similar option in Ubuntu Linux, every file should be renamed manually. 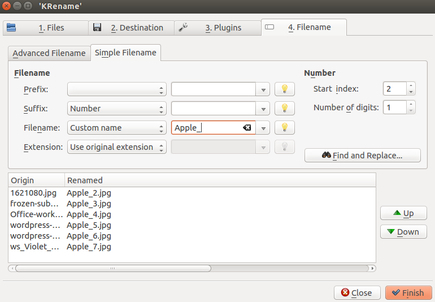 Here is an app known as KRename which will help Ubuntu users to rename multiple files all at once. You can find KRename in Ubuntu Software Center and its easy to install. Once installed just select the files that are supposed to be renamed and click on fourth button ‘Filename’. Here you will find options to rename files in whichever format you want, like using custom name, adding number or date as prefix. Finally, click on ‘Finish’ button this will rename every file in single click.